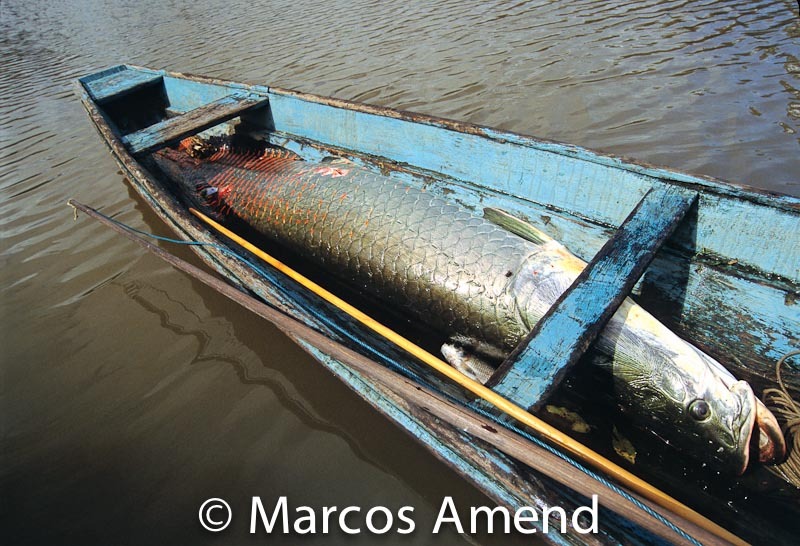 The pirarucu (Arapaima gigas) is one of the largest freshwater fish in the world. It inhabits the Amazonian floodplains and is a species of great socio economic importance. Fish is the main protein source for traditional peoples and communities in this region, and the pirarucu plays a crucial role in food security and local income generation. Over the last 20 years, to avoid this species' extinction, many sustainable fishing initiatives - i.e. pirarucu community management - have been implemented in PAs in AM. As a result, several lakes and rivers have recovered their pirarucu and other aquatic species stocks, via the fundamental process of strengthening community organization. However, these communities currently face major challenges related to fishery management operations activities and access to better markets that could bring greater financial returns, including high costs of logistics and the fall of sales prices, resulting in prices insufficient to remunerate fishermen. This is caused by: markets with intentionally limited buyers; supply only in a limited period of the year; lack of access to funding for working capital and investments in infrastructure; low access to training about production and activity management, among others. Our purpose was to bring this reality to light and to seek ways to overcome these challenges in Indigenous Lands (ILs), conservation units and areas of fisheries agreements corresponding to nearly 15 million hectares of Amazonian forest. These areas include: Canutama State Forest; the Amanã, Cujubim, Mamirauá, Piagaçu-Purus, Uacari and Peixe Boi; the Auati-Paraná , Baixo Juruá , Médio Juruá , Médio Purus , Rio Ituxi , Rio Jutaí and Rio Unini Extractive Reserves (RESEXs); and the Acapuri de Cima, Deni, Espírito Santo, Macarrão and Paumari do rio Tapauá ILs; and 10 Areas of Fisheries Agreements in PAs of the Solimões river. As part of our study, we collected data through interviews with the managing communities and the Institute of Environment and Renewable Natural Resources (IBAMA). From our own records and knowledge of production, organization structures, infrastructure, marketing, costs and revenue, we built a complete database. The analysis provided clarity on the current state of the initiatives in terms of the production capacity, profitability, access to markets, relationship dynamics of among actors in the value chain, as well as the main bottlenecks and opportunities for strengthening the pirarucu's value chain. Our analysis shows that between 2012 and 2016, fishing production increased by 150% and gross revenue had a cumulative growth of 37%. The pirarucu stock and the number of people involved nearly doubled (reaching more than 4,000 persons). In 2016, a total gross revenue of R$ 7 million (USD 1.8 million*) was generated, corresponding to R$ 1.765 (USD 458*) of average gross revenue per person that year. These key and other important data on this fishery management is available in this infographic developed by the project team. The opportunities for improvement opportunities include: the promotion of a cooperation network among producing areas; data collection to subsidize minimum and fairer price agreements; advocacy for greater support and adaptation of public policies to the pirarucu management process; research and innovations in procedures and low-cost infrastructure, with legal criteria appropriate to the Amazonian reality; promotion of ongoing training and technical assistance in business, financial and commercial management and improvement of operational processes for the management of multiple fish species, among others. We presented our results at events in São Paulo and Manaus, Tefé, Carauari and Lábrea (AM) in the second half of 2018. Ultimately, we hope to contribute to strategies that strengthen the pirarucu value chain, and, consequently, other products and fish of AM. This study was developed with the technical support of a group formed by local community organizations, NGOs and government institutions within the scope of the project "Partnership for Biodiversity Conservation in the Amazon: Sustainable Value Chains". This project is part of the partnership established between the Brazilian Government and US government, via the United States Agency for International Development (USAID), and is executed by the United States Forest Service (USFS), the Chico Mendes Institute for the Biodiversity Conservation (ICMBio) and the National Indigenous Foundation (FUNAI). Photo: A pirarucu in a fisherman's canoe in the Brazilian Amazon.